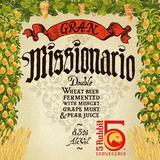 Missionario starts with a wheat beer base, substantial at 8.3% abc. We then use Muscat of Alexandria, an ancient “aromatic” grape that the Greeks brought to Egypt. Add fresh pear juice to this year’s blend and you now have a delightful and sophisticated beer capable of complimenting a wide range of foods from crab tamales to sheep cheese to apple pie.